From the early 1500s to the mid-19th century, millions of African men, women and children were made to voyage the treacherous journey across the Atlantic Ocean to the West Indies aboard inhumanely overcrowded sailing ships. Inarguably the main artery among the routes of the Trans-Atlantic Slave Trade, the Middle Passage took Africans to work as slaves in the New World, supplying the Americas and Caribbean with its largest workforce while bringing tremendous profit to international slave traders. 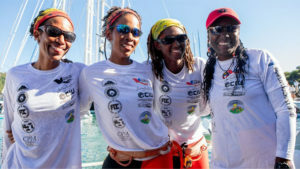 On January 28, 2019, four Antiguan women – Elvira Bell, Christal Clashing, Kevinia Francis and Samara Emmanuel – made triumph out of a tragic legacy, becoming the world’s first all-Black team to voluntarily row across the Atlantic Ocean. 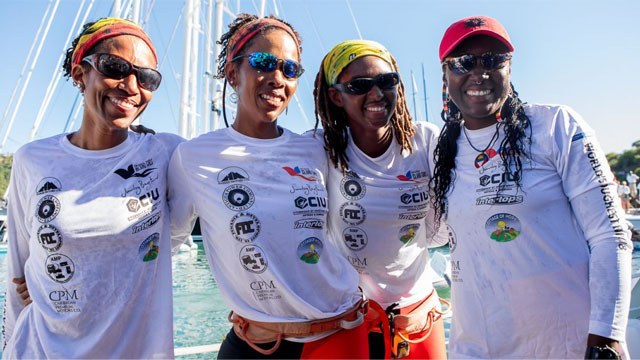 As part of the annual Talisker Whisky Atlantic Challenge, “the world’s toughest row,” Antigua’s Island Girls traversed the same route as their forbears, rowing 3,000 nautical miles from La Gomera in the Canary Islands to English Harbour, Antigua. Heroic is an apt describer for the quartet that braved approximately 47 days, 8 hours and 25 minutes at sea on a 25-foot-long canoe, and under the most uncertain of circumstances no less. Unexpected weather, severe mental and physical exhaustion, and lack of trade winds to help propel them home were just some of the odds at play. Surviving largely off water, meal replacement shakes, dehydrated fruits and what proved to be the ever-so-essential rations of chicken tikka masala, the Island Girls risked their very lives traveling through the mysterious waters of the ocean. Even Murphy’s Law reared its ugly head when it saw their autohelm give out in the latter part of the trip, forcing the women to row by hands for all of 24 hours. Moreover, the collective would not see the final stretch without flirting with their greatest nightmare: capsizing. “There was no night light, it was pitch black, and we didn’t know what that wave looked like or where it came from. There was absolutely no one around. We were paranoid the rest of the way after that,” she continued. Fears and worries aside, the Island Girls also endured a level of extreme discomfort and a series of cringe-worthy inconveniences. “There is no privacy, no bathroom, and we were sleeping in very confined spaces. No bathroom meant you had to use a bucket in front of your other teammates, whether it was number one or two,” explained Elvira Bell, 36, now relieved more than anything after spotting her son in the boisterous crowd on the docks of English Harbour. Embarking on their expedition in December 2018, the Island Girls navigated for nearly 50 days not only the oceanic tides of the Atlantic, but waves of unfathomable fatigue and unsettling hopelessness. “There were days that just felt like we were rowing and rowing, and not actually getting anywhere,” explained Emmanuel. Thousands of spectators got to watch as the Island Girls safely and successfully reached the end of their sail, while Clashing feverishly waved a massive Antiguan flag, whose red borders form a ‘V’ for “Victory at Last.” What comes to mind in that that moment was Trevor Noah’s recent standup at Lied Center, where The Daily Show host talked about the time he learned Rochester, New York was used as a site for escaped slaves to be transported to Canada. “That’s one of the most amazing stories I’ve ever read,” Noah joked, hinting at the levels of persuasion needed to convince a Black person who had just escaped slavery to get on another boat to freedom. One could venture these women set out to sea merely for the sake of adventure. One could also suggest they were simply doing it for charity. After all, as Francis made note, at stake were the funds being raised for Cottage of Hope, a nonprofit organization that houses little girls who have been abused, neglected and abandoned. For Elvira Bell and Clashing, it was doubly a matter of smashing barriers and becoming their ancestors’ wildest dreams. “I’m hoping we influence not just Black racers, but other people in the background. Other little girls, other mothers, and other islanders that are looked at as Third World persons. It doesn’t matter where you come from. We’re small people who saw big dreams, and did what we had to do to get it done,” Bell offered in gushing enthusiasm. The team unanimously echoed Clashings sentiments, explaining the journey – above all – signified “choice and will, along with determination, grit and tenacity,” all of which their ancestors were robbed of when they, too, crossed the same ocean. Resting at their respective homes over the course of the next few weeks, while eating ducana and saltfish to their hearts’ content, the Island Girls’ historical accomplishment precedes our annual celebration of Black History Month, marking quite the cultural and social moment in a timely fashion. The magnitude of their feat is only amplified by their love note to little Black girls all across the Diaspora.